Finding gold is not easy. Finding gold is not easy. Perhaps that is why it has been sought after for many thousands of years. Unlike diamonds, gold cannot be manufactured. It can only be found where it naturally exists. Finding those rare places where gold concentrations in the Earth’s crust are high is difficult, and such discoveries have had enormous impacts on human civilization and history. The average concentration of gold in the Earth’s crust is 0.005 parts per million, which is equivalent to 5 grams of gold per 1000 tons of earth. With those odds, you don’t just start digging anywhere and expect to find gold. But there are certain places where the concentration is higher; those are the places well-suited to mining. A lower grade gold ore would contain something like 5 grams of gold per ton of earth (5 parts per million). So gold ore needs to be concentrated by about 1,000 times its average concentration to become viable. High concentrations of gold were discovered in South Africa in the 1880’s. The city of Johannesburg was founded there as a result of the Witwatersrand Gold Rush, which resulted in the discovery of some of the largest gold deposits the world has ever seen. The discovery was not an entirely happy one. The Second Boer War, 1899–1901, between the British Empire and the Afrikaner Boers, was at least partially a conflict about the rights of miners and ownership of the gold wealth in South Africa. Here finding gold lead directly to war! About 50% of all gold ever produced has come from South Africa. In 2007, China overtook South Africa as the world's largest gold producer, weighing in with 276 tons mined. Other major producers are the United States, Australia, Russia and Peru. Mines in South Dakota and Nevada supply two-thirds of gold used in the United States. According to all geological experience, gold is found almost entirely in low concentrations in rocks. It comes from gravels and quartz veins or is associated with pyrites deposits. 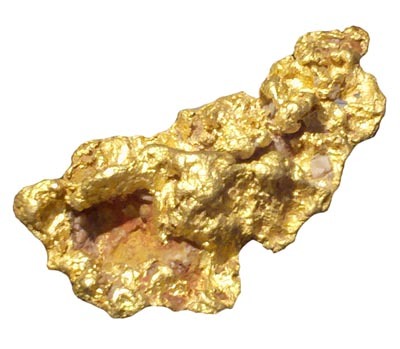 Nuggets are an exception, but they account for the smallest portion of discovered gold. The Earth’s crust isn’t the only place gold exists. The oceans have it too, but its concentration is even smaller there. There’s a lot of it there, collectively, since the oceans are vast. However, extracting it with currently available technology would be cost-inefficient; pumping 1,000 tons of seawater would be more expensive than the small amount of gold it would yield. Though it has yielded far less gold than mining, panning is another method of harvesting gold. Because it is inert and dense, gold concentrates in streambeds, either in small flakes or in larger nuggets, from which it may be recovered by panning. Gold, being dense, also readily falls out of suspension as water slows down. So where a river cuts through gold bearing rock, and then slows down as it hits a flatter/wider river bed, gold will concentrate in a 'placer' deposit, allowing extraction of gold particles by panning and modern day industrial equivalents. The California Gold Rush of 1849 grew out of the gold deposits on the Sacramento River, which were particularly accessible to this technique. Finding gold is no easy feat, but it’s one many people and civilizations across the centuries have deemed worthy of undertaking, in spite of the dangers inherent in it. Gold rushes have caused mass migrations, hysteria, and even conflicts to the point of war. The history of civilization has been in part shaped by the discovery and retrieval of this precious metal. If humankind does ever devise an economical way to harvest gold from seawater, oceans beware.